Originally from the high Andean mountains of Chile, Bolivia, and Peru, alpacas are members of the camelid family which makes them cousins to camels, llamas, vicunas, and guanacos. There are two different alpaca types, the suri and the huacaya. The suri has fiber that grows quite long and forms silky, pencil-like locks. The huacaya has a shorter, dense, crimpy fleece, giving it a very woolly appearance. Alpacas have been breed for hundreds of years to improve the quality of their fleece. Now alpaca fleece is exquisite and highly sought by everyone from fiber artists to high fashion. It is softer, warmer, and doesn't have the bulk of sheep's wool. 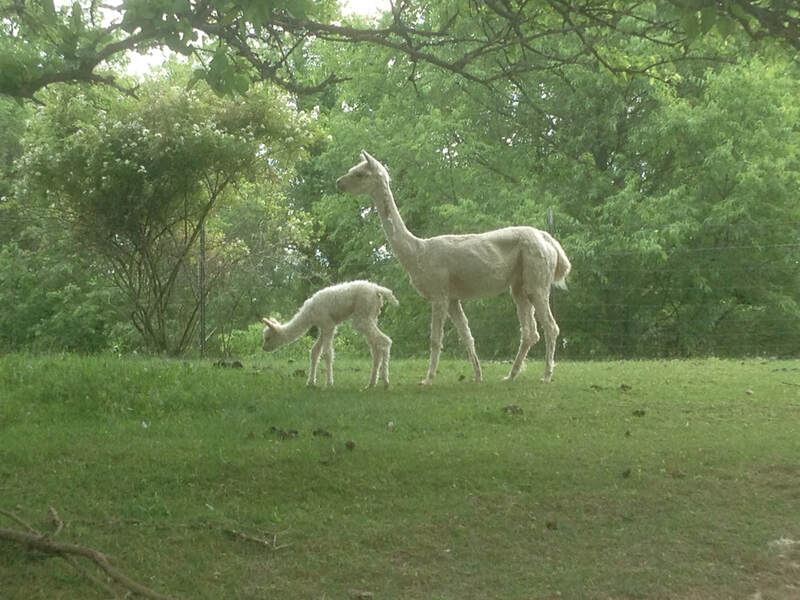 Learn more about alpacas and getting started with alpacas. Alpacas are intelligent and can be trained easily. They are sociable, herd oriented animals who spend their time grazing, sleeping or pronking (jumping around for fun). Alpacas are smaller than llamas, weighing between 120 and 200 pounds at their adult weight. They are low-maintenance, easy to care for, and easy on the land. 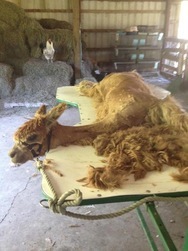 Alpaca fleece is graded and used according to fineness. For instance, prime fleece is used for scarves, socks, clothing. Seconds are used for garments that can tolerate a shorter staple length (our gloves), and thirds are generally used for felted items. Alpacas in general are easy keepers. They need a roofed shelter to protect them from the snow in the winter, and fencing to keep them in and predators out. They eat pasture grass, and hay as their main staple and grain as a supplement. Up to 5 alpacas can graze per acre of pasture or more depending on the lushness of the pasture and whether you feed additional hay. Of course they need fresh water as well. You'll need to find a vet that can help you care for any emergencies that pop up. 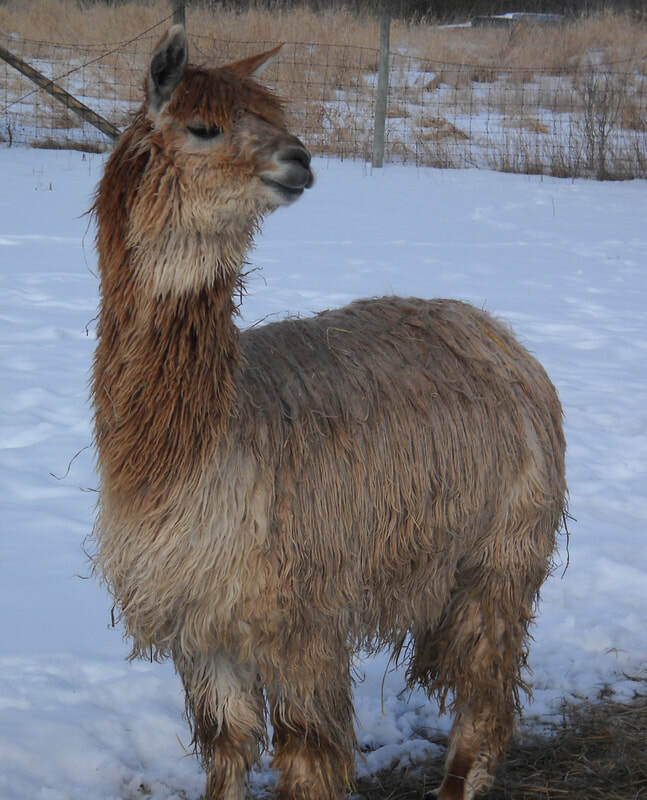 Most large animal vets that care for cows or sheep will have no trouble caring for alpacas. Regular de-worming and vaccinations are needed. Their fleece is shorn once a year in the springtime. There is a great deal of information available on alpacas published online and in books. The Alpaca Owners Association, has an extensive reading library and is well worth looking up. The book I rely on most is the Alpaca Field Manual by C. Norman Evans DVM. It is my bible for veterinary care. Learning about good fleeces and confirmation takes some time. I always suggest talking to multiple farms, and going to a show or two. I visited about 8 farms before I bought alpacas. Be aware of your local zoning regulations regarding a livestock or opening a farm store. Water in each fenced area. Will you use water buckets and run lines for heaters or install automatic, heated waterers? Restraining chute. Some farms prefer to simply halter their alpacas to clip toenails, get weights, administer shots and perform other veterinary care, some farms like to have the help of a restraining chute. Scales to get periodic weights. This can be a big help to identify health issues like not getting enough milk or a worm problem in the winter. Halters and leads, toenail clippers, worming medication, gloves, other routine veterinary care items. A place to store hay and grain outside the alpaca yards. A way to transport your alpacas to and from the vet and other farms. One or two alpacas can fit in the back of a van. For larger numbers, you may want to obtain a trailer. When you get ready to begin selling your alpacas, there will be marketing expenses. Deciding what type of farm you would like is a top priority. Are you going to be a fiber production farm, a showing/breeding farm, or a little of both? Your goals and budget will be different for each option, so its important to give this some serious thought. Also, how big do you want your farm to be? Before you become intoxicated with the idea of baby alpacas running around your pasture, give some thought to how big you want to become. Putting up hay and clean up is much different for a herd of 10 and a herd of 30. Alpacas are addicting, so be thoughtful before you start buying. You might want to invest in a breeding male right away, or with a smaller herd it could be more advantageous to use an outside stud for a number of years while you figure things out. Having females and geldings makes farm life a whole lot less complicated with a smaller herd, not to mention the security issues (males breaking into female pens). If you actively raise alpacas for profit at your farm, all the expenses attributable to the endeavor can be written off against your income. Expenses would include feed, fertilizer, veterinarian care, etc. Capital improvements to the active or hands-on alpaca breeder's ranch can also be written off against income. Barns, fences, animal purchases can be depreciated over their useful life. Equipment such as tractors, pickups, trailer, and scales each have an appropriate schedule as well. Please consult a CPA for the specifics. A very helpful IRS publication, #225, entitled The Farmer's Tax Guide, can be obtained from your local IRS office. Those considering entering the alpaca industry should hire an accountant for advice in setting up your books and determining the proper use of these tax advantages.